What are the Advantages of Tactical Flashlight with Strobe? Today’s tactical flashlights are designed to disorient and temporarily blind a potential attacker through the use of dazzling light. However, there are some products which come with a strobe feature that is designed to produce the disorientation without necessarily creating a blinding effect. What is a Strobe Tactical Flashlight? A strobe is a function of the light where it rapidly shifts from on to off. The strobe effect has been used for many decades in photography to capture fast motion. However, when used with a tactical flashlight, a person or object on the move appears to move in out of sync. This is because you only see pieces of the movement as the light is being reflected back to your eyes seemingly in sections. When the tactical flashlight strobe is directed to your eyes, the effect becomes more pronounced as the rapid on/off of the light creates a unique effect that takes time for the brain to adjust. This has both military and law enforcement uses to subdue an attacker in dark or nighttime situations. There are many proven benefits for the utilization of the strobe light when faced with a potential assailant. However, it must be noted that the strobe effects are only temporary which will give you enough time to take action, but eventually the target of the strobe will adjust to the new conditions. Disorientation: The main effect of the tactical flashlight with strobe function is that it disorients the potential attacker giving you time to react appropriately. It takes several seconds before the person can adequately adjust which gives you time to flee or strike depending on the situation. Affect Use of Force: Because of the disorienting effect, the subject of the strobe light is far less able to use force. Use of force requires coordination and the strobe light will disrupt that ability for several seconds. Reduce Peripheral Vision: The subject of the strobe light will suffer from a considerably reduced peripheral vision which limits their ability to see and respond to events outside of a limited degree of view. This allows you a better chance to escape, or another person can approach with better odds of not being seen. The strobe itself offers more choices for an individual who in imminent danger than the standard bright light. The temporary disorientation has a more profound effect and will provide the time needed to react properly to the threat. Military and law enforcement units regularly use the tactical strobe flashlight as a non-violent means of disorienting and subduing potential risks. 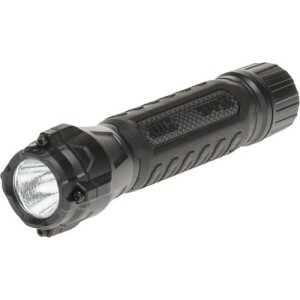 The tactical strobe flashlight with pressure switch allows for quick activation so you can react promptly to a threat. However, it must be noted that you must be prepared for the disorienting effect of the strobe when it is used. While you are not being hit with the strobe light, the effect can also create a bit of confusion if you are not prepared. Overall, the strobe feature on tactical flashlights offers yet another advantage to this simple, easy to use, and non-violent way in reacting to a potential threat. How Suitable is 18650 Rechargeable Batteries for Flashlight? Why I Keep a Flashlight for Self Defense [Top Reasons]? Tacticalogy.com may be a participant in the Amazon Services LLC Associates Program, an affiliate advertising program designed to provide a means for sites to earn advertising fees by advertising and linking to Amazon.com.